Explore Halloween PowerPoint templates, embellishments, Snagit stamps and more stuff. Halloween, or Hallowe'en, is celebrated on the night of October 31st, it is originated from the 2000 year old Celtic festival of Samhain. Halloween activities include trick-or-treats, ghost tours, parades, bonfires, costume parties, visiting "haunted houses", and carving jack-o-lanterns. Halloween symbols include witches, pumpkins, bats, scarecrows, etc. You can learn more about Halloween on Wikipedia. See a visual presentation (scroll down this page) and download a PowerPoint presentation on Halloween here. Indezine Halloween Kit is a self-contained set of content that provides everything you need to create picture slides for PowerPoint. This kit contains a Halloween PowerPoint Theme, a scary font, some silhouette pictures, scrapbook style embellishments, some pictures, and even a few sample slides. Read more. Halloween Picture Layouts download contains over 10 Halloween themed picture layouts presentations. You can use these layouts to create super cool presentations. These are essentially ready to use Presentations with Picture Layouts that include placed embellishments. First copy the slides you like to have in your own presentation then start adding your pictures. This entire kit comes with 10 presentations with many picture layout variations and different background styles. Ppted.com is providing you a special discount of 20% off the normal price on Halloween PowerPoint template and background collections. This offer is valid today! Use this coupon code INSPIRE and grab this special discount! Explore these Halloween templates on the special landing page. 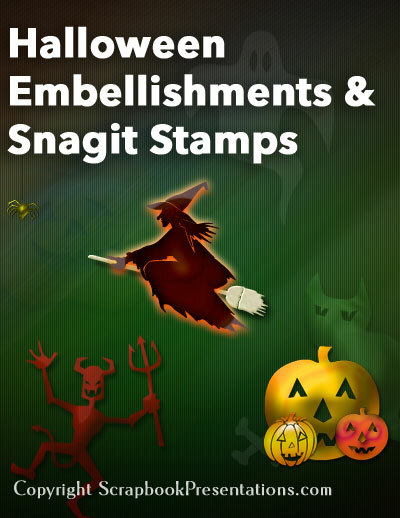 This download contains over 200 Halloween themed scrapbook embellishments, Snagit stamps, and backdrops. You can use these embellishments to create super cool scrapbook presentations.